I remember when games were all just blocky pixels. Before the polygons took over, in the years before high-definition graphics, ragdoll physics and rim lighting, videogames were little more than a collection of garish dots, a handful of kilobytes crammed onto floppy discs and audio cassettes. In the early 1980s England of my youth, the advent of cheap computers such as the ZX Spectrum gave rise to the bedroom coder; a lone enthusiast whose midnight programming efforts were sold in small advertisements in the back of magazines or picked up by tiny publishing houses. Most of the games from that era were clones of popular arcade machines of the day, usually clumsily wrought versions of Breakout or Space Invaders, but some were startling in their scope and innovation. Programmer Sandy White wrote one of the earliest graphics engines to create an entire isometric 3D city in Ant Attack, while Ian Bell and David Braben crammed a galaxy of planets into a mere 14kb for their seminal sandbox epic Elite. In fact, my rainswept country has long been a haven for its brand of creative eccentrics. In the 18th century, it became strangely fashionable for the wealthy upper classes to build things called follies which were flamboyant edifices that stood as symbols of their creators' wealth and taste. One of England's most well-known and influential follies was built by Horace Walpole, the foppish son of the country's first prime minister. Walpole took an initially modest west London villa and, over the space of thirty years, transformed it into Strawberry Hill: A grand mock castle steeped in its creator's obsession with the medieval. Strawberry Hill's turrets, wooden battlements and stained-glass windows ushered in a new era of Gothic revival architecture. Over the course of his lifetime, Walpole stuffed Strawberry Hill with around four thousand pieces of art, curiosities and antique knick-knacks, from the hats of long-dead cardinals to a lock of Mary Queen of Scots' hair. There are more similarities between the activities of an 18th century aristocrat and videogames than you might at first think. 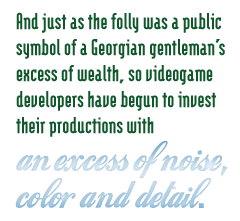 The developers of the 21st century have, like Walpole, a dandy's eye for disparate bits of pop culture. Magpie-like, the shiniest moments and flashiest camera angles have been plundered from the archives of cinema, literature and comic books; MadWorld's monochrome visuals were freely borrowed from Sin City, while Heavy Rain's themes and murky style bear more than a passing resemblance to David Fincher's Se7en. Modern games are bigger, louder and more expensively produced than ever before, and just as the folly was a public symbol of a Georgian gentleman's excess of wealth, so videogame developers have begun to invest their productions with an excess of noise, color and detail, where each title attempts to outdo the last in terms of graphics, sound and the sheer extravagance of its action.